Q. How do I test the soil in my garden? It is a good idea to test the soil in your garden when you move into a new garden or there is an area of your existing garden that is performing poorly. In addition, a soil test could prevent you from making unnecessary changes e.g. by adding too much fertilizer. This is an environmentally responsible practice as it leads to less contamination of water resources. The soil can be tested at any time but fall is the best time. Collect samples from a number of different sites in the plot or garden. Take the sample from 3 or 4 inches below the surface and place in a plastic container or plastic bag. Label each container with the site from which the specimen was taken. Testing the pH (acidity or alkalinity) of the sample is relatively easy with a pH testing kit available from most nurseries and some hardware store. Alkaline soil can be adjusted by adding sulfur or compost. Soil that is too acidic can be corrected by adding lime. Do-it-yourself soil testing kits for nutrients are available but it is best to have an evaluation done by experts. Soil testing services are offered by many state cooperative extension services and by commercial laboratories, for a fee. You should use a local service, if possible, as they will have good knowledge about conditions in your part of the country. Different levels of testing are available. 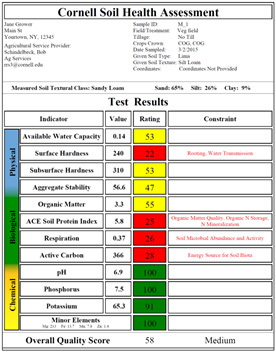 A basic or routine soil test will test for pH (i.e. acidity or alkalinity), and extractable phosphorus, potassium, calcium, magnesium, zinc and an estimate of cation exchange capacity (CEC). It may also test for minor nutrients, e.g. iron, manganese, copper, zinc, boron, molybdenum, chlorine and aluminum. A value for nitrogen may also be provided but this is not particularly useful as nitrogen values can change very rapidly in any garden plot. The laboratory may also provide you with information on the physical properties of your soil, e. g. particle size, aggregate stability, organic matter, etc. This will help you to determine whether you need to amend your soil with sand or grit or more than the usual amount of compost. The service should also provide you with suggestions on how to fix any problems. If you are just getting started with your garden or considering a thorough renovation, our guide Site Inventory and Analysis for Landscape Design may be useful.